Tiny Whoop is a tiny FPV (First Person Video/View) quadcopter. If you have been to one of our open house events over the past few months you more than likely have been buzzed by one of these tiny helicopters (Sorry!). Wondered what all the fuss was about? Curious about getting your own Tiny Whoop? Here is our getting started guide to get you in the air with the rest of the makers! Well, since we are Makers and while you can buy a ready to fly Tiny Whoop (~$275) what’s the fun in that? We’re handy do-it-yourself Makers of course we’ll build our own! 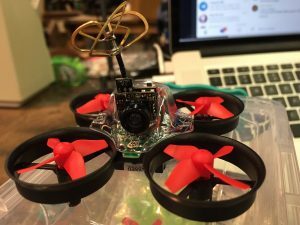 You can start like many of us did with the cheaper Tiny Whoop Clone: Eachine 010, Eachine TX01 Camera, and a budget FPV Goggles. For around $84 (before tax, shipping) you can be in the air without breaking the bank! You’ll probably want some extra batteries so you can keep flying while recharging dead batteries. Keep in mind that while going this route is cheaper, you will have to wait for the items to ship from the Chinese warehouse (not everything is in stock in the US warehouse). You can also part out your own flight controller (FC, we recommend the beecore). With an upgraded FC you can use your existing controller/transmitter. You can also upgrade the motors easily and some of our members are experimenting with 3D printing ultra light frames to get even more performance out of their racers. This is enough to get you in the air and competing with other Tiny Whoop racers at the space. Happy flying, hope to see you at our next Open House Meeting! Sonny recently shared his current progress of his UAV Quad Copter project and included a test flight video. So today I had my first real flights with my quadcopter UAV. The setup is pretty advanced and it takes a lot to get up to speed. I’ve learned a lot from my build. I made custom printed PLA motor mounts, which have worked out really well to hold them on the end of aluminum pipes. Unfortunately the cross in the middle which is also PLA could not handle the rough landings and cracked. I’ve secured it for the time being, but I think I’ll be milling something better Wednesday. If I can work out the stability issues, I’ll bring it Friday. Anyway, check out the first flight/set of flights.